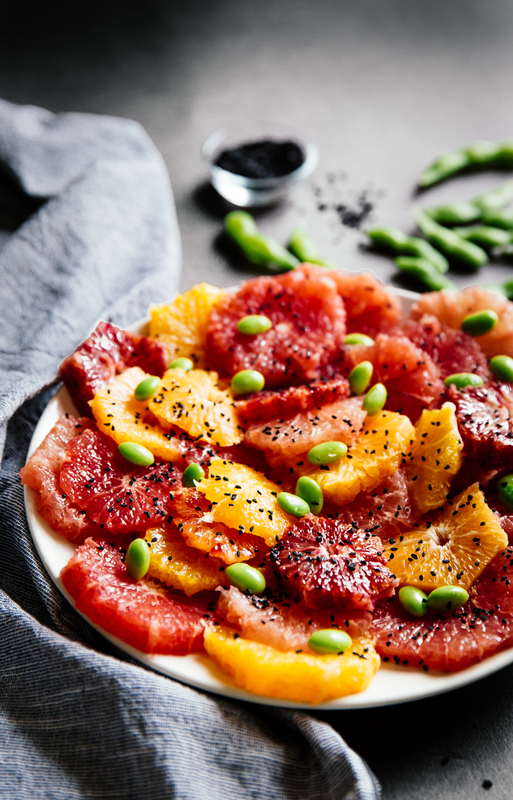 Perfect for winter and filled with all the beautiful fruit available, this bright and refreshing citrus & edamame salad is as easy as it is satisfying. I am endlessly in awe of the fresh produce available in spades during spring and sumer. All the captivating colours and intoxicating smells, all the different textures which beg to be used in different dishes, usually requiring very little handling at all. I am in awe indeed and I miss them when the warm months are gone. And then, in the middle of winter, when all hopes of light and warmth are unwillingly but still necessarily put to the side, I become aware, somehow by chance and almost alarmingly, of the devastating beauty of citrus fruits. 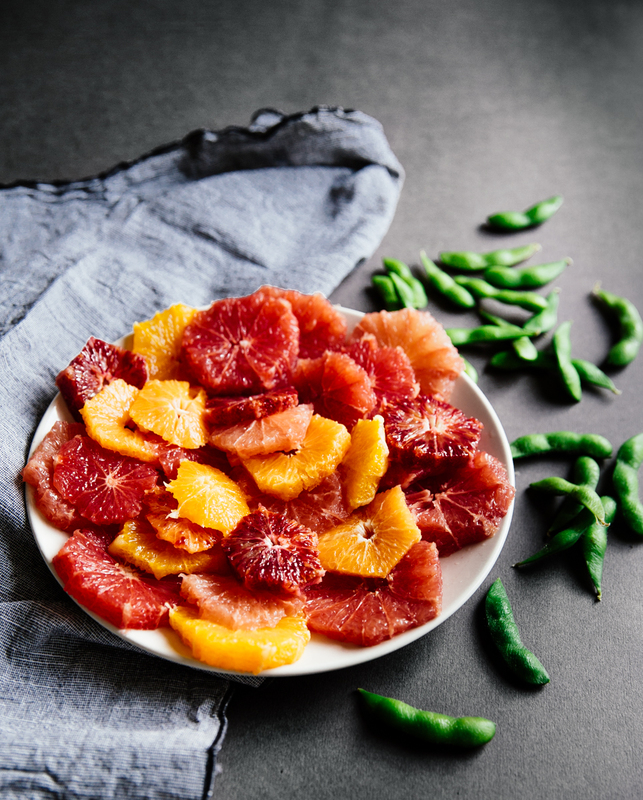 Blood oranges with their wild scarlet flesh; oranges with their smooth, comforting hue and very dear sweet fragrance; the ever mesmerising ombré shades of pink grapefruits; and finally the endearing bright orange of clementines, along with that familiar, strong essence. In all their beauty, all their glory, all the recognisable stickiness they leave hands with, they take me back to my childhood winters: it’s dusk in our kitchen, the days are devastatingly short and schooldays are even shorter and harsher still, especially for my drama-prone early teenage spirit. I despise winters, and school, the early darkness and the lack of colour in everything. And yet, there’s always a selection of citrus on the counter and they’re almost glowing in that damn twilight; and there’s their fragrance and their soft but sturdy skin and that first drip of juice down my chin after that first bite. And just like so, there’s a little more light and a little less drama. 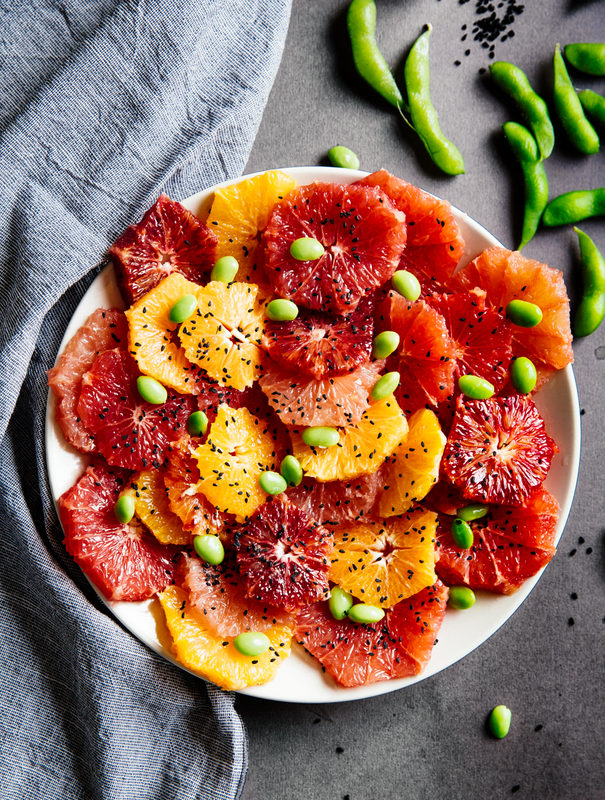 This beautiful citrus salad is just as simple, just as satisfying: it’s merely fruit really, sliced, arranged and served with a handful of bright green edamame. Their demure, slight sweetness balances out the fruit’s underlying bittersweetness and the sprinkle of nigella seeds offers a delicate hint of savouriness. No drama, just the bright glow of citrus. Cut & slice the citrus: start by cutting the two ends from each fruit, making sure you are cutting away enough of the peel. Stand the fruit upright on one ends and cut away a thick stripe of the peel from the top all the way down to the end, following the curve of the fruit as much as possible. Remove all of the white pith under the skin in one continue movement. Carry on like so around the fruit, removing both peel and pith as you go. 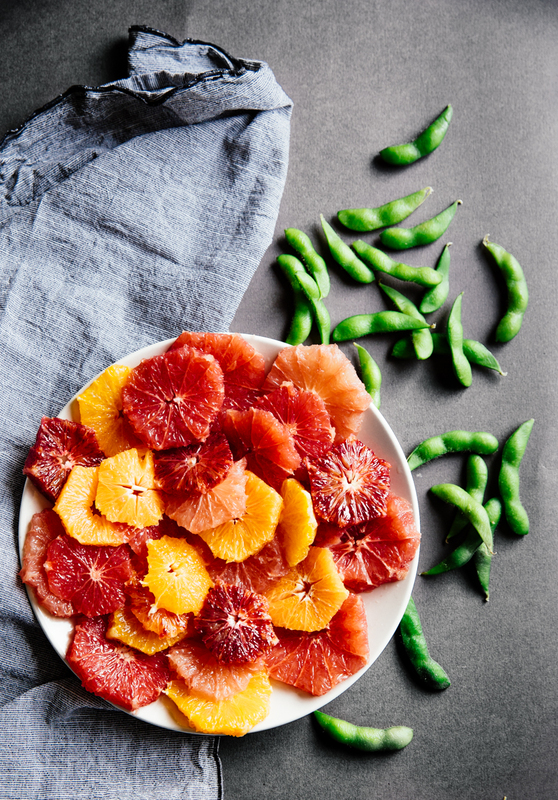 When you are done, lay the citrus on its side gently and cut into medium size slices. Arrange on a serving plate- take advantage of the different colours and size to create a cool display. 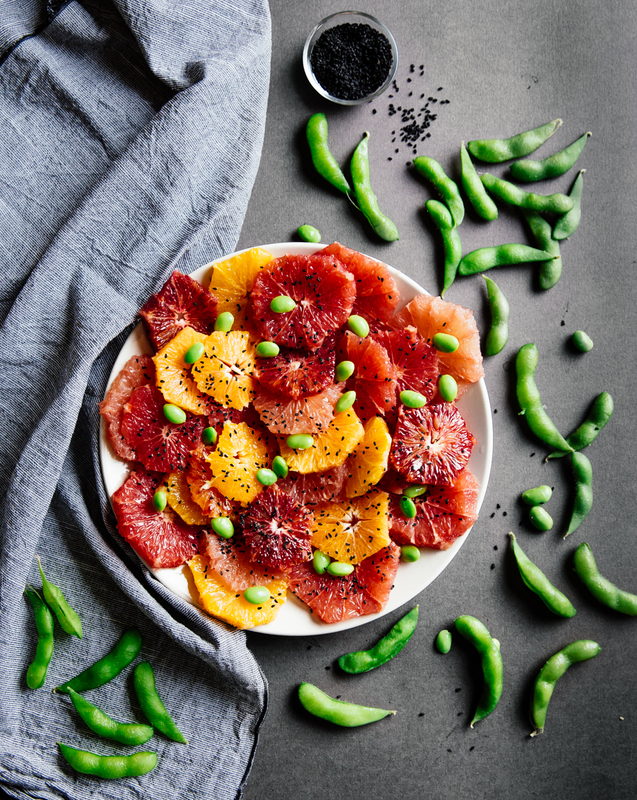 Top with the shelled edamame and nigella seeds. Drizzle with some mild olive oil and a pinch of sea salt flakes if desired and serve. Tonight I’m gonna make sushi. It will be our salad. Sound great (I wish someone was making sushi for me too!)! Thanks so much for stopping by, my dear!